Caleta de Fuste and Costa Caleta are two names for the same resort. Located on the eastern coast of Fuerteventura this purpose built resort lies very close to the airport and benefits from a transfer time of fifteen minutes. Cheap Caleta de Fuste holidays. 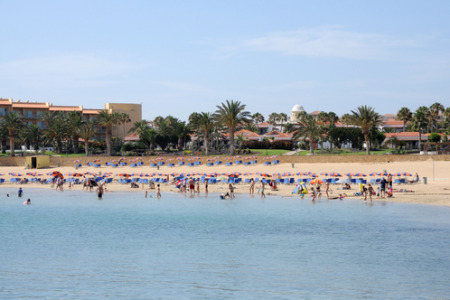 Cheap Caleta de Fuste holidays can be taken at any time of year as the Canary Islands suffer no extremes of temperature, with moderately hot summers and mild winters. Caleta de Fuste holidays are very popular with families with younger children and couples of all ages. The sheltered cove, with its imported sand, is a great attraction for those wielding buckets and spades and who enjoy paddling in shallow, tepid waters. A variety of water sports are available. It is a great resort for those seeking relaxation as life here is lived in the slow lane, the perfect choice for those wishing for respite from busy lives. Obviously summer time is when most visitors arrive but it is also a very popular winter destination. Although a modern resort, Caleta de Fuste accommodation is built in traditional style which adds to the charm of the resort. It provides high standards of both comfort and service. Restaurants are many in number and cater for all tastes. An abundance of shops provide for all your holiday needs and there is a Saturday market. Although there are one or two lively venues, Caleta de Fuste nightlife is generally low key and is family oriented. If a Caleta de Fuste holiday appeals but you find the thought of trawling through web page after web page looking for the best deal a little daunting, try our simple search facility. You'll find over three dozen travel companies, including leading brands, competing for your custom. It is simple to use, and remember, competition brings out the best bargains. Our search facility enables you to see, at a glance, the Caleta de Fuste holiday that is the cheapest, and the one that offers the best value for money. It couldn't be easier. All you have to do to secure the holiday is make a phone call. As offers change daily, in order to avoid disappointment, you should ring today.